Screenshot with overlaid status bar and appended navigation bar placed in a device frame. For introduction to screenshots see article. for delivery to both stores. This is used to capture screenshots on iOS using iOS UI Tests. This captures screenshots on android using android espresso tests. This is used to place captured iOS screenshots in a device frame. screenshots combines key features of all three Fastlane products. 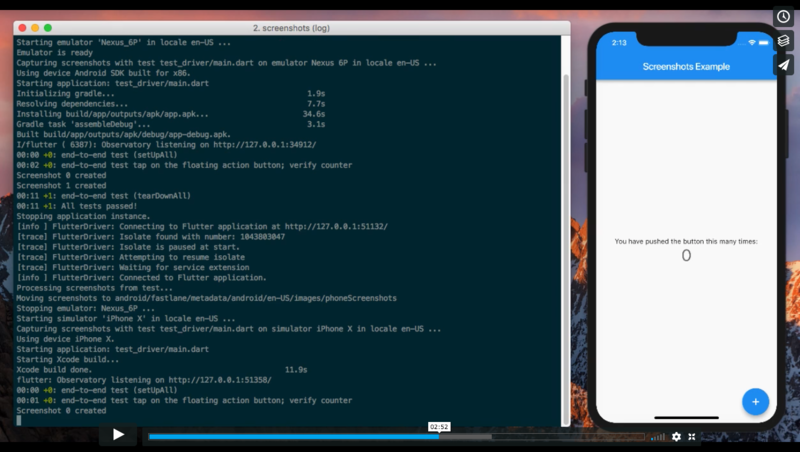 Captures screenshots from any iOS simulator or android emulator and processes images. Frames screenshots in an iOS or android device frame. The same Flutter integration test can be used across all simulators/emulators. No need to use iOS UI Tests or Espresso. and supply for upload to respective stores. Capturing screenshots using this package is straightforward. the screenshots package that is called by the test each time you want to capture a screenshot. then process the images appropriately during a screenshots run. Note: make sure your screenshot names are unique across all your tests. you select have supported screens and corresponding emulators/simulators. Within each class of ios and android device, multiple devices share the same screen size. Devices are therefore organized by supported screens in a file called screens.yaml. Use the latest screens.yaml, not the sample below. Modify the list of devices in screenshots.yaml to your selected devices. Install an emulator/simulator for each selected device. screenshots will validate the config file before running. the version of screenshots in your pubspec.yaml. If upgrading screenshots in your pubspec.yaml, you should also upgrade the command line version. (unless you are only testing for android). The Watch tips project has been updated again, The interface has been tidied up and a seperate value for the tip cost has been added and displayed ( a requested update).